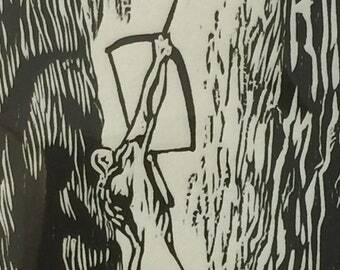 Announcement Welcome to the world of woodcuts. All original, all hand-made, created and printed by the artist. 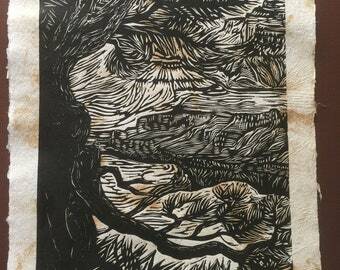 Welcome to the world of woodcuts. All original, all hand-made, created and printed by the artist. Such a beautiful piece! It was a gift for a family member who just loved it. Love it! It's absolutely beautiful, and arrived safe and quick! Just renewed, hand colored yesterday . Spent a peaceful day with my Windsor watercolors and Spanish music in the background. In a frenzy to clear out my festival inventory! Matted works will go up daily at bargain prices until I drop (or I run out of inventory). Never too early for holiday gift shopping, is it? Back to the drawing board, where everything begins. Carving at a festival; the chisels make the drawing come alive! Inking the block, this one is a collaboration project or puzzle print. After a roll through the press, presto! a gorgeous print off the block. My booth at a festival under a double rainbow; so it rained, so it was beautiful! 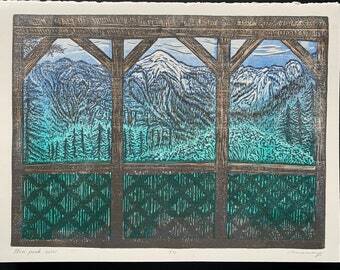 Woodcut artist in love with life, I have today, that is it, this ONE day, that's how I live. Once I had a real job and loved it, because I love what I do. 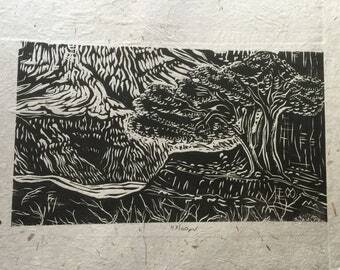 But then I started making art, woodcut prints to be exact, and I was hooked. 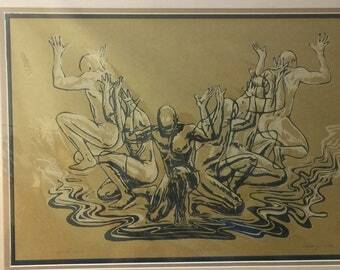 My art career started with one fine arts festival in which I grossed $120!! Since then there has been about 200 festivals and 3 online shops; the latter is what I prefer as it is less exhausting and more fruitful. It takes time but I enjoy every minute, not only the making of art works but even the framing, packing and shipping. Twelve years later, less road trips and more internet. My collectors now span the wide world and I think it is amazing to send prints to Japan, the UK or Bulgaria. 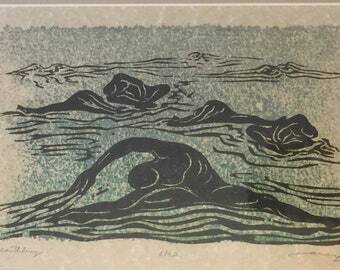 My goal is to make 1000 woodcuts, in this life or the next. I keep creating and working and in the process I find bliss. Love what you do, enjoy life!!! Maria Arango is a full-time artist living in Las Vegas, Nevada, Maria has been widely exhibited. Festivals and online shops help feed the art habit and feed the feral cats from the neighborhood. 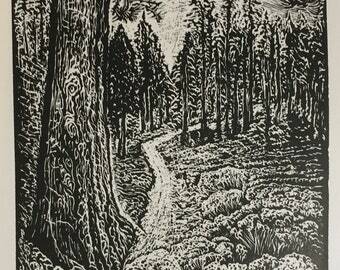 Daily habits are making woodcuts and healthy walks. 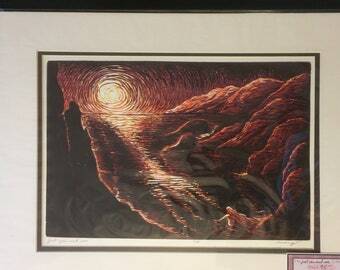 After original woodcut editions are sold out, quality reproductions are offered of selected sold out images. All reproductions are clearly labeled as such. Reproduction prints are printed on demand on quality archival paper, inspected by the artist, signed and shipped from my studio. 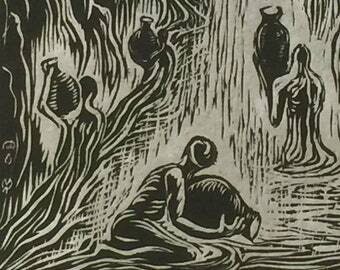 Welcome to the World of the Woodcut! 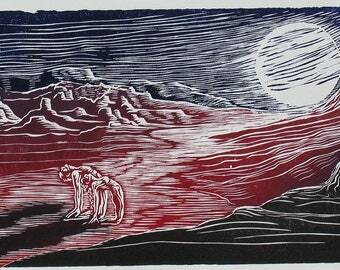 I am a printmaking artist based in Las Vegas and enjoy spreading my woodcuts and wood engravings all over the world. 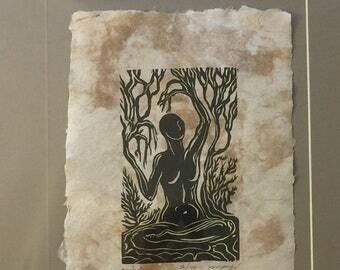 All my images are original, created, carved, and printed by me in the peace of my studio. Art is meant to be enjoyed! If for any reason you are not satisfied with your purchase, please let me know. I will arrange for return shipping at my cost. Once I receive the item in the same condition it was sent, I will refund your initial payment plus shipping. Lost or damaged items are replaced at my cost. Pay with credit card or PayPal via Etsy Checkout. Checks and money orders are welcomed, items shipped after payment clears. I do not charge a handling fee, you pay only actual calculated shipping. International buyers pay actual calculated shipping. VAT and any destination local postal services are the responsibility of the buyer, please note that item value cannot be altered to avoid these charges. International buyers should inform themselves of any VAT and other destination local postal services charges. Orders are shipped by First Class Mail or Priority Mail, flat and well protected. Larger prints are shipped rolled in a tube. All orders shipped within two business days of payment. I replace damaged or lost items so no insurance is necessary except for items valued above $150 or one-of-a-kind items. If you do not receive your item in a timely manner, please email me immediately for a replacement. I welcome questions and requests and comments. 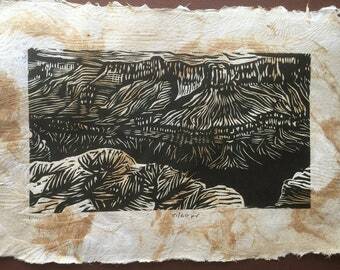 All my woodcuts are signed and numbered in pencil and include a Certificate of Authenticity. 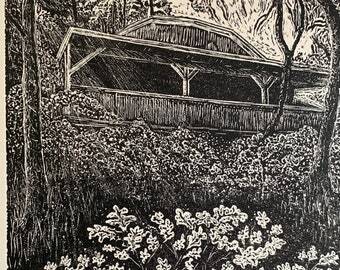 Commissions gladly accepted for series or one-of-a-kind works; keep in mind a one-of-a-kind woodcut is more similar to a painting in design and often takes longer in execution. Contact me and we can talk about your artistic needs. Wholesale galleries and other resellers please contact me for generous quantity discounts.